The Xbox 360 arcade has enriched the lives of gamers since 2005, adequately priced games for anyone's enjoyment. Now, 4 years later, the inflation rate of Arcade games seems to have surpassed the housing market in percentages. 4 years doesn't seem like enough time to have gamers saying "Why back in my day, games were a nickel!" But, that's how some of us are feeling at the moment. 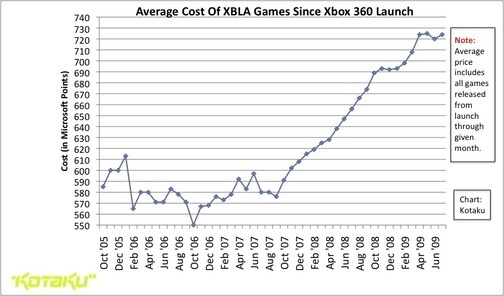 Kotaku did the math, and the average price of Xbox LIVE Arcade games has increased from $7.31 per game to $9.50. Of course, averages bring the cheapest and most expensive together as one, so that may not seem like all that much. But, try to think about how often you spent 400 2 years ago, to your 1200 now. A solid example of this inflation rate would be Bionic Commando: Rearmed, providing a quality remake of a classic game at 800 . Where a similarly spectacular remake, the Teenage Mutant Ninja Turtles: Turtles In Time Re-shelled is set at 1200 just a year later. Both of these titles are "Summer of Arcade" features with co-op and full makeovers from their classic selves, yet the price changed from $10 to $15. We do notice and appreciate that Arcade titles are increasing in originality, and substance. However, we're curious why this much of an increase is necessary. Gamers are having a hard time justifying a set $15 price tag for an Arcade game that may have once cost a manageable $5. Many people are even waiting as long as their willpower holds out for the "Game of the Week" deals from Xbox, never knowing if the game they're craving will make the cut. Of course, with Arcade games on multiple platforms, Microsoft isn't the only culprit. PSN games will sit at $14.99 in the shop, just the same as any 1200 game. How does this effect co-op gamers? The Xbox LIVE Arcade has been increasingly interested in co-op gaming, bringing gamers together to 'Splode their summer away, or relive the Turtles In Time. Sure, not all games will follow suit, but many are getting comfortable at $15 a pop. For more gaming price point fun, check out Destructoid's Rev Rant about full game prices, as well.